The list of the best pressure washer would not be complete without this brand. Honda Pressure Washer has come a long way since the time it was launched in the market. Actually, in 2016, Honda Motor Company ranked 23rd among the most valuable brand in the world. The pressure washer from this company has Honda red engine which is known for its excellent quality, great value, and reliability. Because of this, we have come up with the Honda Pressure Washer reviews which feature 3 of their best models. However, for those who wish to jump into the final verdict, here is a quick recap on what we think about this three models powered by Honda. 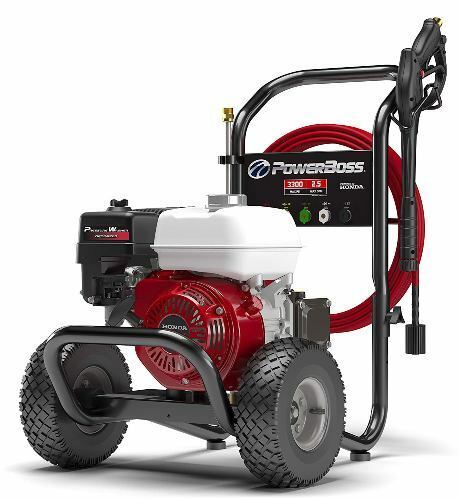 The Powerboss gas pressure washer is one of the powerful washers of Honda. The axial cam pump is maintenance free with a thermal relief valve. 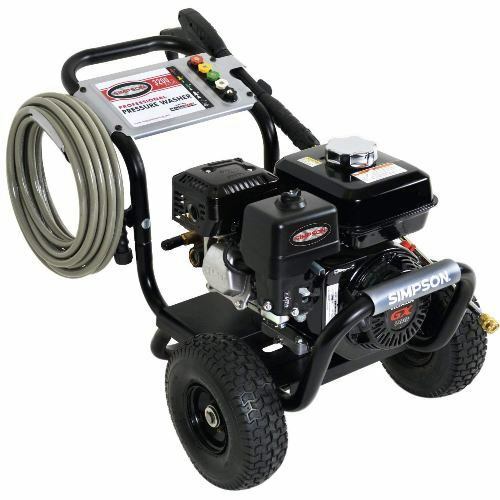 This pressure washer is powered by a 196CC Honda GX200 engine and can be adjusted up to 3300 PSI and in between because of the triplex pump. This means that it can clean the patio furniture to removing stains. It includes 5 quick-connect spray tips which also include a soap tip to make it easier for the washer to provide a better result. It is very flexible because of its 30-foot easy flex hose that enables for easy use and storage. 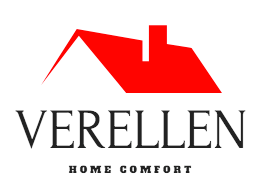 The product is backed by a two years limited consumer warranty as well as three months limited commercial warranty. 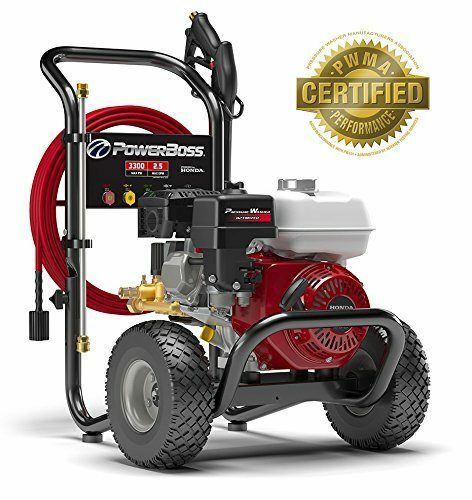 PowerBoss pressure washer is certified by Pressure Washer Manufacturer’s Association (PWMA). The flow rate (GPM) and water pressure (PSI) claims for this product were tested and verified. This ensures the quality of the product. Ryobi 2800 PSI pressure washer is a popular cleaning tool. They offer units that will meet all your cleaning needs. This washer has a powerful GCV160 Honda gasoline engine that produces 2800 PSI at 2.3 GPM. It has a total cleaning power score of 6440. The engine is enclosed on a steel frame with the exhaust situated on the top of the washer. Also, the frame serves as a carrying handle. The total weight of this unit is 56 lbs, it is not at all easy to carry around. Good thing, the pressure washer frame is mounted on top of two big plastic wheels to make it easy to maneuver. One can turn the gauge knob found at the spray wand to change the pressure. This is very vital, considering that power washers can harm some sensitive areas. The wand is attached to the washer with a 25-ft long high-pressure hose, which is enough to help you reach the more hard to reach areas that you need to clean. The main feature of Simpson Cleaning PS3228-S is that it has a triplex plunger pump, with ceramic coated pistons, that enables users to clean any surface. It also has PowerBoost Technology that can only be found in this brand. With this feature you will get higher and more consistent at the nozzle, enabling you to spend less on fuel for a better result. Included is 25 ft. hose designed to resist kinking and looping. It is also resistant to abrasion. Simpson Cleaning won't leave marks on your walls or deck with this hose either. The frame made of welded steel protects the engine, and a solid steel axle plate provide you added stability and strength. You will not have a hard time adjusting the pressure the 5 quick-connect nozzle - 0, 15, 25 and 40 degree nozzles and a soap applicator. There are lots of pressure washers that provide a strong PSI, but with weak performance because of the quality of craftsmanship. With Simpson PowerShot, this is not the case. Pressure washers that provide less than 2400 PSI usually have a single adjustable spray nozzle that generates 0 to 60-degree fan patterns. 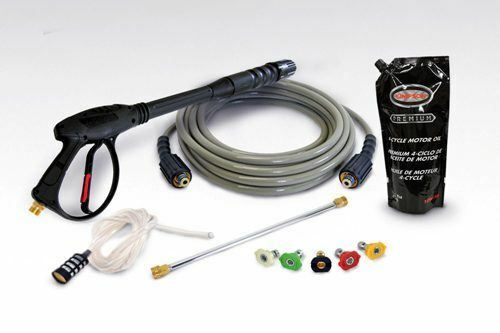 Some brands of pressure washer offer accessories like a turbo or rotating nozzles. 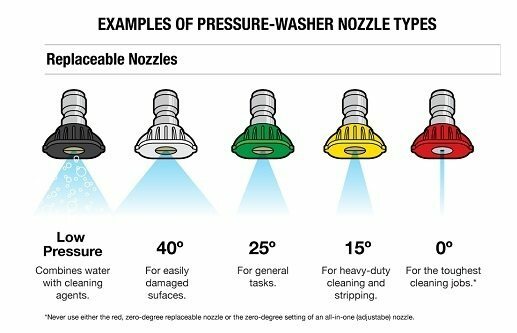 These added features can help clean more efficiently as compared to standard adjustable nozzles because they spin the water stream. A heavier-duty unit usually has 4 or 5 color-coded nozzle tips. It makes specific fan apparent - wider for using detergents, narrower - for removing deep stains and medium for general cleaning. To use the nozzle tips, insert it into the spray wand by folding the quick-coupling collar, pushing the tip in as far as it can go and release the collar. Check to make sure it is firmly locked in place. Never point the spray wand to people and property when you start the engine. Horse Power (HP) - You will encounter this term several times in this article. The HP refers to how much pressure and volume the pump can provide. Pounds per Square Inch (PSI) - The pressure produced by a pressure washer is measured in pounds per square inch or PSI. This is the pressure that contributes to the cleaning team. 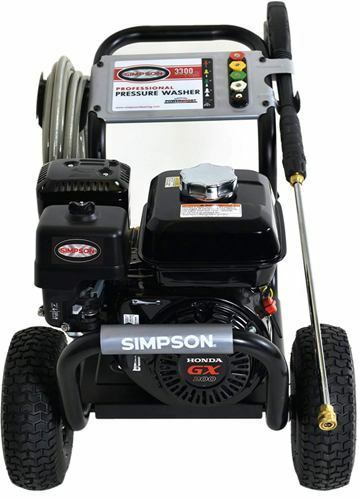 Gallons per Minute (GPM) - The amount of water generated by a pressure washer is expressed in GPM or gallons per minute. This also contributes to the cleaning team. Cleaning Power Units (CPU) - CPU or cleaning power units measure the cleaning the ability of the tool. To compute for CPU, multiply GPM x PSI. Keep in mind the greater the CPU, the higher the capacity of the machine in cleaning thoroughly and effectively. 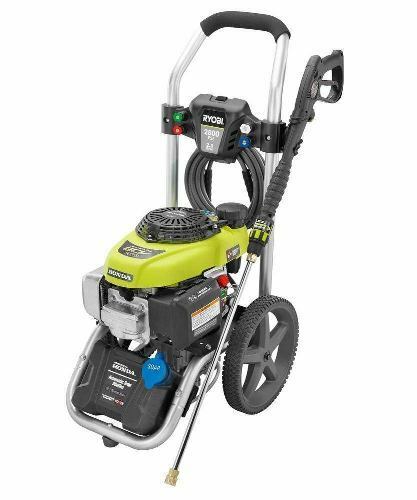 Looking for a lightweight pressure washer for light-duty tasks, check out this article for our best electric-powered units. 1. How long can you run a pressure washer with Honda engine? Run the washer for a minute to warm up. Remember not to run the washer longer than 3 to 5 minutes as the trigger is off. Adjust the pressure and spray settings allowing the washer to run and then trigger off or you can insert nozzle tips in the spray wand. 2. How high should the PSI pressure washer be when cleaning concrete? In cleaning your car, look for a washer that can provide 700 lbs. of pressure per square inch or PSI. 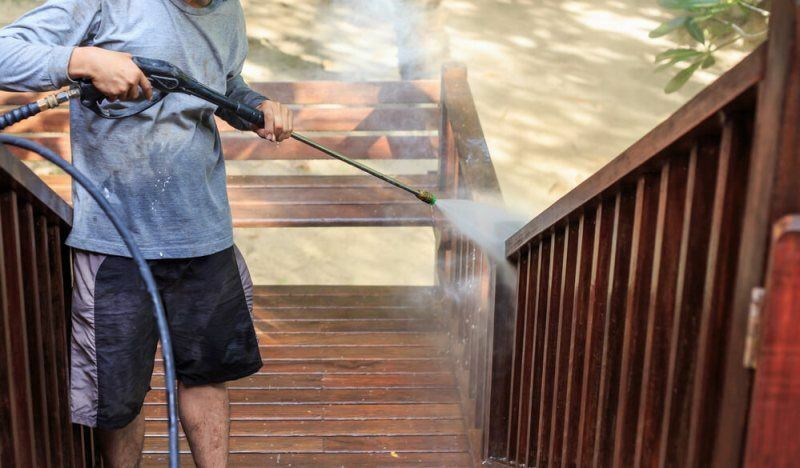 A 1500 PSI is needed to clean the exterior of your house or deck. For the concrete driveway, you need 3000 PSI. 3. 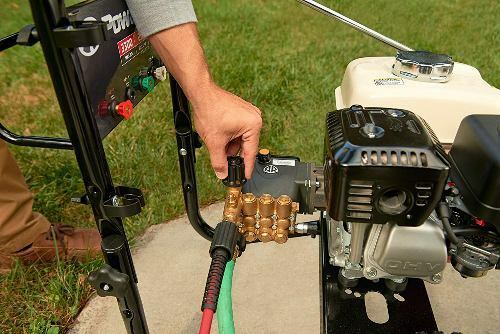 What kind of oil does the Honda Pressure Washer Use? It is essential that you use oil that is clean, fresh and has unleaded gas with 87 octanes in a pressure washer. Gasoline having up to 10% ethanol is accepted. Do not use gasoline not approved like E85 in the pressure washer. 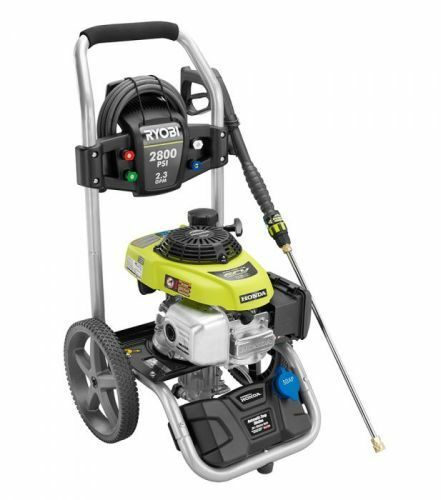 This Honda Pressure Washer reviews include the best products this brand has produced. For many years, Honda is a reliable brand and has been providing the consumers the best tool not just for cleaning but for other purposes as well. Among the three pressure washers reviewed, we find PowerBoss 3300 PSI as the perfect choice for your cleaning needs. It is best for cleaning your patio furniture, driveway, and others. It is certified by the PWMA; therefore you are assured that you will get the best product with Honda engine. The frame is made of powder-coated steel, and it is user-friendly. The review rates PowerBoss pressure washer 4.8 stars out of 5. If you find this post helpful, you can comment below and share it with others.